think:lab: Forget Puppies; He's Getting His Own QR Code! Thanks to a QR Code generator, my kid gets his very own QR code this 12/25. For most of my arch/edu clients/audiences, QR codes were new. I had little to zero interest in looking at the actual technology behind these content-embedded phone-scanning 'images'. That's somebody else's gig. All I wanted to do was emphasize that information/content is everywhere -- along with the ability to connect to it, edit it, mash it up -- and that such a realization should have an impact on the way we think of 'boundaries' in campus/school/classroom design. Legit info value? Performance art only? Or just Marketing 2.0 gone awry? Not sure if my Beckett will truly face a day when every street corner, deli shelf, billboard, movie ticket, hip-n-trendy clothing item, or museum display will be QR codified and PDA/cell phone readable. Maybe yes. Maybe no. 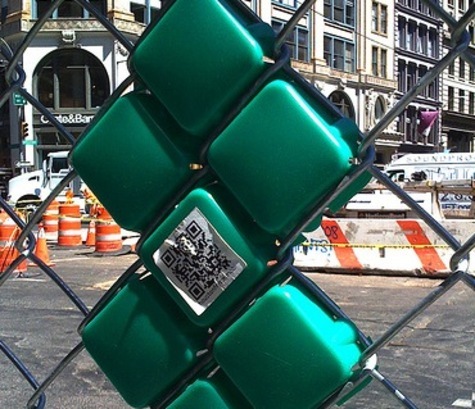 But the idea that "Learning is Everywhere" that underlies QR tech? Well, that I'm pretty sure of. Doesn't this strike you as a reather key flaw in this technology...? Stephen: Admittedly, QR codes lack the warm-n-fuzzy characteristic that will allow them to be embraced by the common man. But one imagines that the little black/white stripes on the side of a box of Twinkies that allow the neighborhood chip shop or Walmart superstore scanner to read the price, weight, store location, inventory count, and timing of the next delivery never worried about the warm-n-fuzzy element either. It just worked. And sooner or later, it became industry standard. Now, as I hinted at in my post, I never showed QR codes to my conference audiences in order to highlight the literal technology. It was just a metaphor of sorts from my P.O.V. Sure, it'd I'd be cool if the image was seen as a 'little bunny' with tiny dots arranged at such a small scale that they were hardly visible to the naked eye -- what? sounds like TV images -- just to allow the big ol' world throw their arms/hearts around them. Certain that the ah, so that's what that is! epiphany would occur sooner by potential users. Could work, but the visible image is not really of interest to me, to be honest. What does interest me, however, is the sheer concept that 'content' | 'information' -- both in a static and in a 2-way collaborative manner -- is everywhere. Perhaps QR codes will go the way of buggy whips and Beta VCRs. No matter. But I do look forward to the day when the physical world literally becomes tagged like a Google Earth information-laden map. P.S. Enjoyed seeing you pop up today, Stephen. Been a long time. Hope all is well on your side of the border.